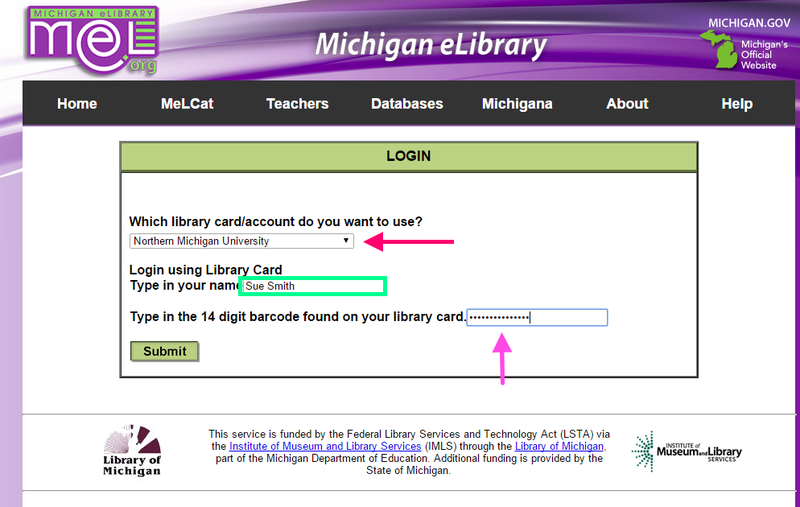 MeLCat is a book and video loan system brought to you by the libraries of Michigan featuring our very own Olson Library. It offers personal selection and fast delivery directly to our library. Over 450 libraries participate in MeLCat, offering a large variety of materials in an easy to navigate system. If a book isn’t offered in MeLCat, try InterLibrary Loan (ILL). It offers all types of media including articles, which MeLCat does not offer access to. So how does MelCat work? Let’s say I’m writing a report on women who have advanced far in their careers and I need specific texts to back up what I’m preaching. 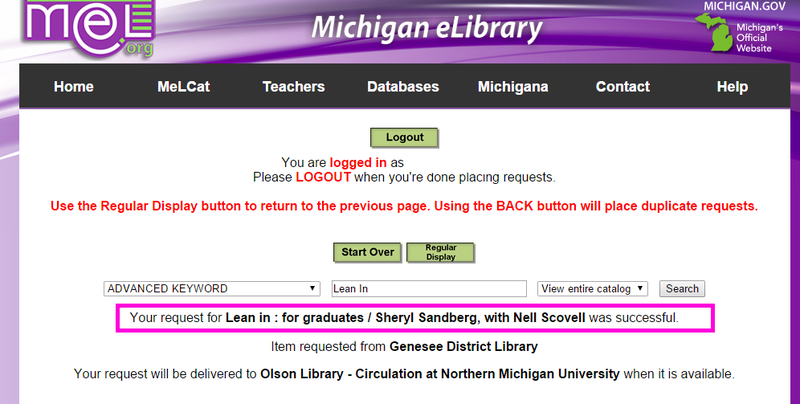 I looked at all the books the library has to offer but I reallllly want the book Lean In: For Graduates by Sheryl Sandberg. 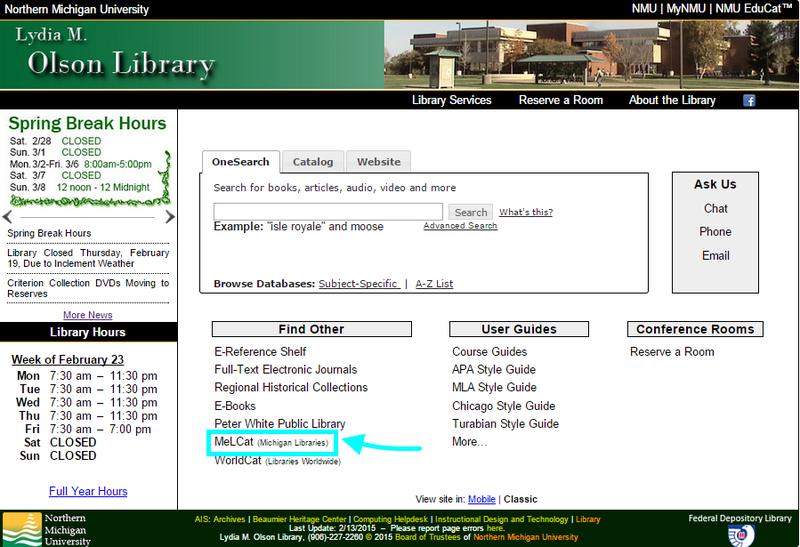 First, go to the home page library.nmu.edu and click on the MeLCat link as listed below. 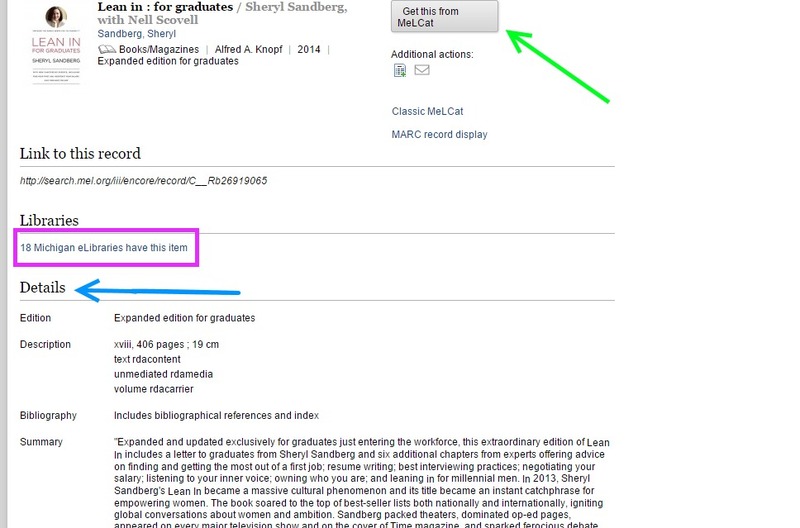 Within MelCat you can easily search by subject, title, or author. After you have typed the title, hit Search and you’ll be taken straight to a list of results. Look at all of your options. The original Lean In book pops up first but the book for graduates that was more recently released and revised, is what I want. The red rectangle will take you straight to the check out screen. The green arrow is pointing at a hyper link that will take you to a page with more information on the title such as what libraries have it and what the book is about.The yellow circle shows you how to search by format and underneath the circle, you are given more options as far as formats go. After you decide on your title, you may click the button next to the title that says “Get this from MelCat!” or you may click on the title which will lead you to a screen like this. It shows you where the book will come from and the specifics of the title. You can get the title by clicking next to the green arrow, see which libraries have it inside of the purple rectangle, and read the book information from the blue arrow. 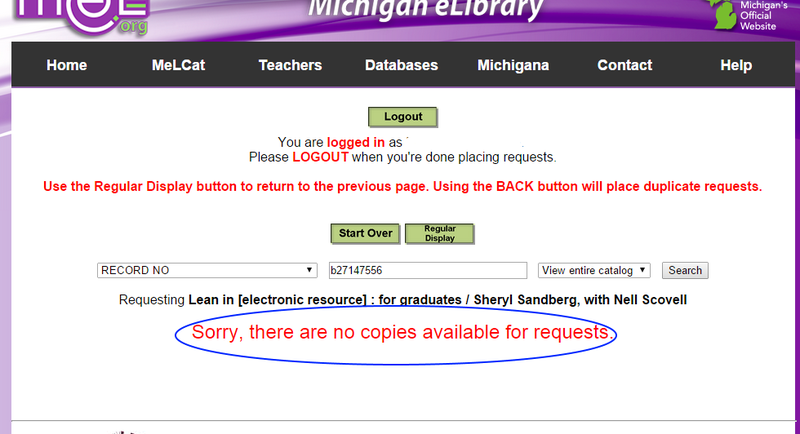 To get your books, you will have to log in. You will need your NMU ID. The red arrow shows you where to pick the instution you are registered with. A menu will drop down and you’ll have to scroll to find NMU. Then type in your name in the green box and put your card’s barcode in the box with the pink arrow pointing to it. 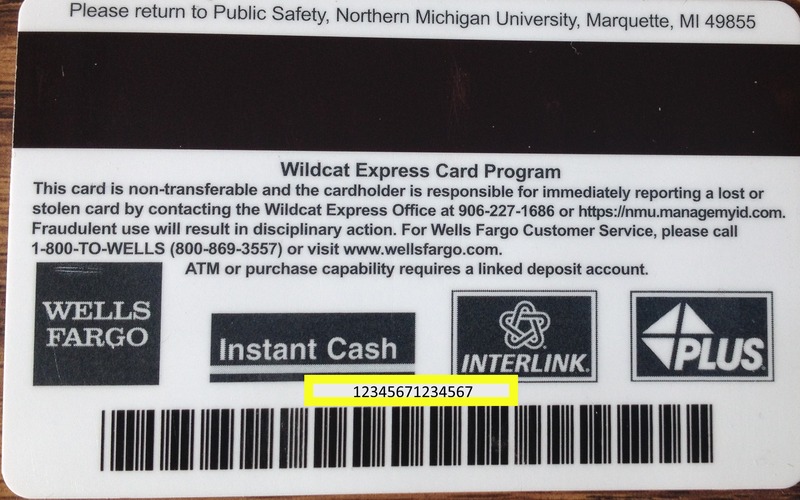 The barcode number can be found on the back of your ID. It’s fourteen digits and sits right above the actual barcode as shown below by the yellow rectangle. If the title is NOT available, you will get a message like the one circled in blue. In this case, go back to the results page and find another title. Please note that electronic resources may not be checked out. And if your title is available, you can check it out and afterwards you’ll get a screen like this. As shown by the pink rectangle, you can see that your order was successful. When your book arrives at Olson Library (roughly two weeks from the order date) you will get an email saying it is waiting for you at the front desk. There is also tracking available from your MeLCat account page. If you have any questions, please feel free to call, chat, email, or stop by the front desk! Happy reading!